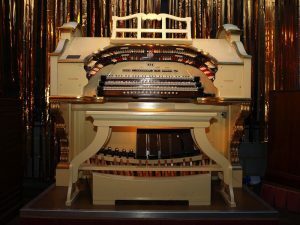 The Wurlitzer was originally installed in the Empire, later Granada theatre, Edmonton, where it replaced a smaller 7 unit Christie when the theatre was rebuilt. Numbered 2183 (220 special) it was played on the opening night, 28th August 1933, by American organist Don Baker. The ten units are played from a three manual console, and there is also a grand piano attachent. The percussions were installed in a separate chamber at Edmonton, a feature replicated in the installation at St Albans, giving the organ five expression pedals – a unique feature in the UK. The organ had the distinction of being the first Wurlitzer to be assembled in Britain and not shipped as an entity from the USA. 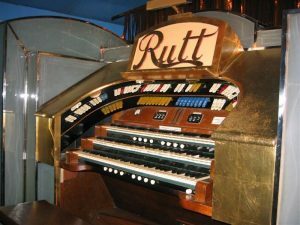 The Rutt Unit Organ originated in the Regal Highams Park, London E4, being one of only three cinema unit organs built by R Spurden-Rutt of Leyton. It was played on the opening night by Stanley Lambert and contained the following 6 units: Tibia, Open Diapason, Concert Flute, Viol, Vox Humana and Tuba Horn. Additionally, there are two synthetic stops: Saxophone and Orchestral Oboe. The three manual console has a unique illuminated surround and the middle manual is a coupler. The action is electro-pneumatic. The organ remained in good condition, being tuned regularly, until bingo was introduced in 1963 and the console was boxed in. By 1966 the orchestra pit had been boarded over and, after many years of neglect, the organ was finally purchased and removed in 1984. Two years later it was installed at St Albans and, after restoration, was opened by Dennis James on May 24th, 1987. A tuba has since been added from another Rutt unit organ.